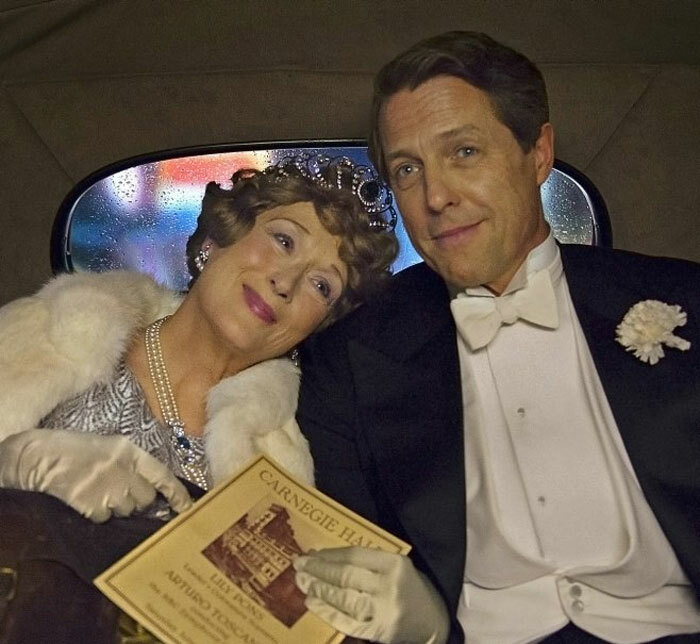 'Ours is a happy world,' says society host and genial man about town St Clair Bayfield (Hugh Grant) of the charmed life he shares with his wife, music patroness Florence Foster Jenkins (Meryl Streep); a life of ease, pleasure, privilege and most of all, music. Yet a life that also conceals a sorrowful secret, that will ultimately destroy them. And no, the secret isn't that Madam Florence, while fancying herself a virtuoso colaratura soprano, is actually the worst singer in the world; this is an open secret that devoted Bayfield keeps from her through cunning networking, selective ticket sales and liberal bribes to reviewers. But when Florence cuts a record which becomes a surprise hit and books herself to star at Carnegie Hall, the open secret is finally blown... and how. Because to call Florence a bad singer is to do her an injustice: she is a spectacularly, exuberantly, unbelievably terrible singer, producing noises most human beings can't even attempt. Most human beings – but not Meryl Streep. Streep's last two ventures into musical territory – the wearisomely upbeat Mamma Mia and truly ghastly Into the Woods – didn't do much for me, but here she is simply divine. Not only does she tie her vocal chords into incredible terpsichorean knots, screeching like a banshee one minute, swooping skittishly the next, but she's also just delightfully likeable, always remaining just the right side of caricature (read, scenery-gnawing ham). Never before has self-absorption been so charming and lovable - or so side-splittingly funny. Hugh Grant gives possibly his best performance ever as Bayfield, a retired actor who knew he was good but would never be great - a description that could well apply to Grant himself, except that here he almost is great. And accompanying Florence on piano we have Simon Helberg (better known as Howard from The Big Bang Theory) whose sweet, nervy performance and spot-on comic timing complete the trio perfectly. The styling is gorgeous too, as beautifully and artificially staged as our heroine's rarified world. Florence's outfits are almost characters in their own right, while the art deco salons and gracious architecture bring the glamour and elegance of 1940s New York wonderfully alive, with each extra so beautifully turned out and posed you expect them to break into a big number at any minute. I really wasn't sure I'd like this film, but I have to say I loved it. I laughed, and, yes, I cried: take a tissue because beneath the comedy lies real tragedy. Like Jenkins herself, the film is brave, stylish, ott, funny and brings genuine joy. Best of all, like recent biopics The Theory of Everything and The Danish Girl, the film shows that love comes in many forms and, ultimately, is all we leave behind. Bravo Florence Foster Jenkins.